In 1986, Stephen King released the terrifying horror novel It. Then came the TV mini-series It in 1990 with Tim Curry as the evil clown Pennywise. Now, Stephen King’s It is released to the big screen. Starring Bill Skarsgård as Pennywise the clown and a cast of young up and coming actors, It brings thrills, chills, and horror to the big screen. It tells the story of a band of misfit boys and a single girl. Billy Denbrough (Jaeden Lieberher), Ben Hanscom (Jeremy Ray Taylor), Richie Tozier (Finn Wolfhard), Mike Hanlon (Chosen Jacobs), Eddie Kaspbrak (Jack Dylan Grazer), Stanley Uris (Wyatt Oleff), and Beverly Marsh (Sophia Lillis) join forces to defeat the maniacal Pennywise the clown after Billy’s brother Georgie goes missing (you see he is dragged into the sewer by Pennywise early in the movie). But how does a band of misfits defeat an evil clown? It tells that story. And tells it well. The question remains. Can leadership lessons be found in It? The answer is a resounding yes, there are leadership lessons in Stephen King’s It. Caution: Stephen King’s It spoilers below. Billy and Georgie Denbrough (Jackson Robert Scott) were building a paper boat as It begins. Billy needed wax to seal the boat and make it sea-worthy. He tasked his young brother Georgie to obtain the wax. The only problem was the wax was in their cellar. That cellar was a scary place, especially when the light wouldn’t turn on. Georgie had a choice. He could do the scary thing and get the wax or he could choose to avoid the scary thing. Georgie chose to be brave and do what scared him. Leaders face scary situations on a daily basis. From choosing to hire or fire an employee, do business with someone they don’t know, or bring on a new product line, leaders face scary situations. Great leaders know they can’t let a situation that is scary stop them from doing what needs to be done. We see Mike Hanlon on a farm. He’s holding a device used to put down sheep. He stands there frozen in fear. You can see the hesitation in his eyes. He doesn’t want to kill the sheep. But he doesn’t want to disappoint those he’s working with. In the end, Mike showed the sheep kindness. He refused to put the sheep down. While this didn’t save the sheep, it did show Mike’s kind heart. In another scene, Beverly meets Ben, a new student to the school. He’s having trouble moving his bike, carrying a science project, and listening to New Kids On The Block on his Walkman. Ben tries to move out of Beverly’s way only to fumble with the items he’s juggling. Beverly shows kindness to Ben by speaking kindly to him and being friendly. Leaders have a choice. They can be cruel (then they wouldn’t be a great leader) or they can show kindness (what great leaders do). Be kind when you have the opportunity. Kindness pays off in the end. He’s dead. There’s nothing we can do. Nothing. Zach is Georgie and Billy’s dad. And he gets angry when he sees Billy has built a simulation of the sewer system in Derry, the town where It takes place. Billy is trying to figure out where Georgie could have come out of the sewer. Could Georgie still be alive? Billy has hope. Zach knows better. He knows his son is dead. There’s nothing to be done about his son’s death. Searching the sewers and the quarry will do nothing to bring Georgie back. What leadership lesson can be brought out from this It quote? There are times when a leader can do nothing to improve a situation. The leader will have to choose to move on. To stop pushing and pulling. He has to put the past behind him and move forward. Realize there will be times when you can do nothing. A boy should be spending time outside with his friends. In an attempt to understand what has happened in Derry, Ben spends time in the library researching the history of Derry. A librarian approaches Ben and gives him wise advice. Young boys should be spending time outside. Enjoying nature and their friends. I believe the librarian’s advice is great advice for leaders as well. Leaders need to have a group of friends they can enjoy time with. They need to get out of the office and enjoy the outdoors. Don’t sit behind your desk all day. Go home. Spend time with your wife and kids. Go out with the boys. Enjoy yours. The group of young boys was always bantering with one another. They’d fling insults and wisecracks at one another. Their words weren’t meant to be mean. They were being boys and forming a bond by picking on one another. To some, this may seem odd. Picking on someone doesn’t make them like you. But it can. And leaders need to have friendly banter with their team. Leaders needn’t insult their teams like the boys did in It. They need to use friendly banter to uplift and encourage their team members. If I were Betty Ripsom, I would want us to find me. The group of boys was searching the sewers when they found an old shoe. The shoe belonged to a missing girl named Betty Ripsom. After finding the shoe, the boys began to argue. Do they continue to look? Does it matter? What should they do? One of the boys spoke up. He knew what he would want if he were Betty. He would want someone to look for him. Great leaders look out for their people. They search for ways to bring great people back to the fold and to bring great people into the fold. Don’t leave people behind when they struggle. Find ways to help them succeed and come back. Ben was the new kid at the school. Henry Bowers (Nicholas Hamilton) was the school bad boy and prick. He would pick on kids who didn’t fit in. Ben fit the mold of Henry’s attacks. Henry and his gang of rabble rousers had brought Ben to a secluded location. There, Henry began to carve his name into Ben’s stomach. Ben fought back and was able to toss himself over the guardrail and tumble down the hill. When he landed, he was near the quarry where the boys and Beverly were. He stumbled into the sewers and the boys found him. They made a decision. They would help him survive/succeed. The boys did this by fighting back against Henry and his friends. They threw rocks and kept them at bay. When you bring new team members onboard, you have to help them adapt to their new environment. Give them the tools to succeed. Introduce them to key members of the team. Find ways to make them feel welcome and succeed. Help new team members to succeed. Ben spent a lot of time in the library. He was studying the history of Derry. He wanted to know if kids disappearing was a common thing or something new to the town. What he found out was scary. Adults disappeared at a higher than the national average. Worse, children disappeared at an even higher rate. Ben had the information. He did the research. And he knew something wasn’t right and action had to be taken. Leaders have to do their research when entering into business transactions with customers, when hiring new employees, and when making large business moves. Having well-researched information will help you make the best decisions you can. Billy, Ben, Richie, Mike, Eddie, Stanley, and Beverly each had an encounter with Pennywise. It wasn’t until they shared their stories with one another that a deep bond formed. Sharing their stories let them know they weren’t alone. There were others who had seen Pennywise and they weren’t crazy. Leaders face some crazy situations. You may even think you’re alone. You’re not. This is why sharing your story is important. You’re going to form bonds with those you trust to hear you. You’re also going to realize you’re not alone in what you’ve faced. Be willing to share your story. What happens when another Georgie goes missing? Billy asked this question as the gang was trying to decide whether or not to continue their hunt of Pennywise. Should they be content they’re safe or should they destroy the evil clown once and for all? This It quote relates to the question of doing what is right even when the right thing is tough. Great leaders know they must do the right thing, even if doing the right thing could hurt them. Be a great leader. Do the right thing. The boys and Beverly took action. They decided to enter the Neibolt House, the house where Pennywise lived. While searching for Pennywise, they become separated. One by one, they face horrors until someone else shows up to help them out. Isolation is a dangerous thing, especially for leaders. Great leaders know they need to have a band of brothers. Men and women who will hold them accountable and give wise advice. Avoid isolation at all costs. I want to run towards something. Not away from something. Beverly wanted to leave the town of Derry. The boys knew this and one of them confronted her about her desire to leave. He thought she wanted to leave to get away from something. The truth was Beverly wanted to run TOWARDS something better. Great leaders run towards better things. They choose to pursue what is good and right. They avoid running away from things just because they’re bad. Billy’s gang disbanded and they went their separate ways. Then Beverly went missing. Billy knew something had to be done. He began making phones calls and doing in-person meetings. He had to get the gang back together. The troops had to be rallied. Big events call for manpower. Manpower can be had by rallying the troops. Put a call out for help. Tell your team you need them. Rally the troops. If we stick together, all of us, we’ll win. Billy had learned isolation was dangerous. When the boys came back together, he encouraged them to stick together. Once again, stick close to great counselors and friends. They’ll help you get through the tough times and call you on your crap. Billy finds Georgie’s raincoat where the missing children were floating. He knew Georgie was gone for good. And he began grieving. His friends wouldn’t let him grieve alone. They cried with and consoled him. They were there for him. Great leaders are there for their team members through their trials and tribulations. They’re willing to grieve with those they lead. Are you? Do you know the reason Pennywise lived? He fed on the fear of people. Without fear, Billy, Beverly, and the boys were able to defeat Pennywise. They faced their fears and put the beatdown on Pennywise. Fear causes us to do irrational things. Be aware of your feelings. Control your fear. Then take controlled action. I’m a huge horror movie fan. I know many church leaders are wary of horror movies due to the fact they allow people to feel fear. For me, that’s not what I like about horror movies. They engage my senses. Horror movies show me how we let fear into our lives and how that can damage us. That’s what I like about horror movies. But will you like Stephen King’s It? That depends if you can get over the language used in It. The boys are foul-mouthed and there are a lot of four-letter words used in the movie. There’s also scenes of violence and suggestions of sexual abuse. These things can put people off from watching It. Question: Have you seen Stephen King’s It? If so, did you take away any leadership lessons from Stephen King’s It? 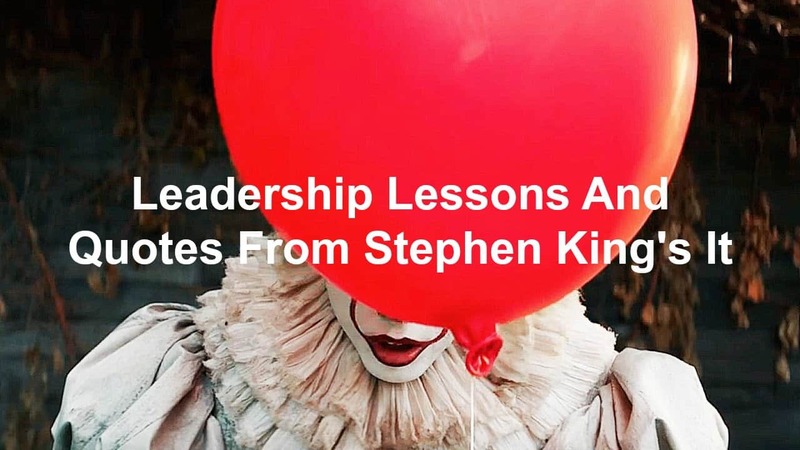 If you didn’t watch It, what leadership lessons from Stephen King’s It that I shared impacted you the most? Let me know by leaving a comment in the comment section below.